Posted on January 30, 2019 February 13, 2019 by Vic Drover. Reading Time: 5 minutes. Since the costs of purchasing a professional, electronic scoreboard is prohibitive for most amateur teams, I thought I would design a solution that would be accessible for nearly any team. Large enough to be visible from across the pitch. In our case, the players and coaches stand opposite the fans on the far side of the pitch. This way, the board faces the fans and the team can change the score as needed. Heavy enough to withstand windy conditions. Light enough to transport easily. Durable in all weather conditions. With these requirements in mind, I set about designing a do-it-yourself scoreboard. After doing some research and getting some ideas from the internet, I decided on an initial design consisting of a sheet of plywood coated with magnetic paint. Magnetic numbers and text would indicate the teams and scores. 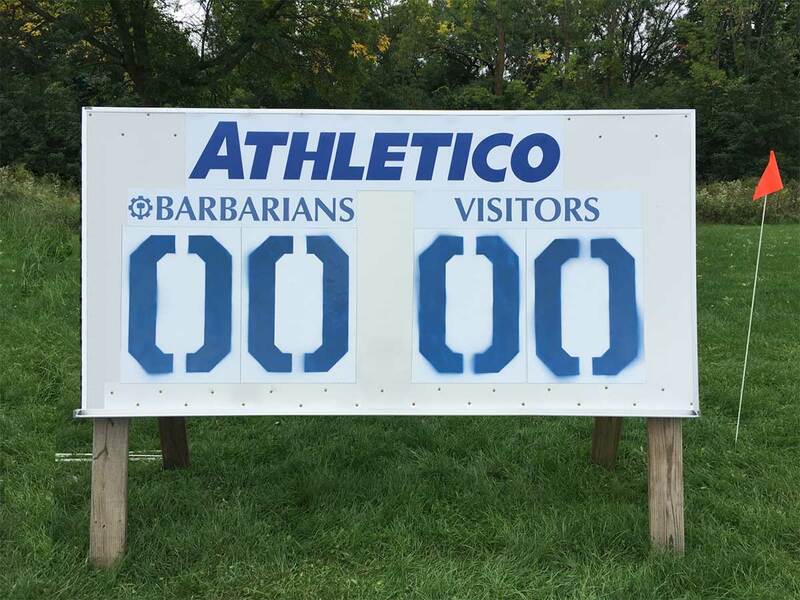 After discussing this with the handy folks around our club like Joe ‘Mama’ Schuster and Pat ‘Sharpo’ Sharpe at the Milwaukee Barbarians, we tweaked the initial design. First, we decided that magnetic paint would wear quickly and not be magnetic enough on windy days. We opted for a magnetic whiteboard instead. These can be pricey ($300-$500), but we managed to find a cheap one on Craigslist. Second, after some testing we found that the numbers on the scoreboard needed to be about two feet tall. Any smaller and they would be difficult to be see at a distance of 70-80 yards. Unfortunately, we discovered that magnetic numbers and letter sets are very expensive. Instead, we decided to make the number sets ourselves using vinyl-coated magnetic sheeting and stencils. 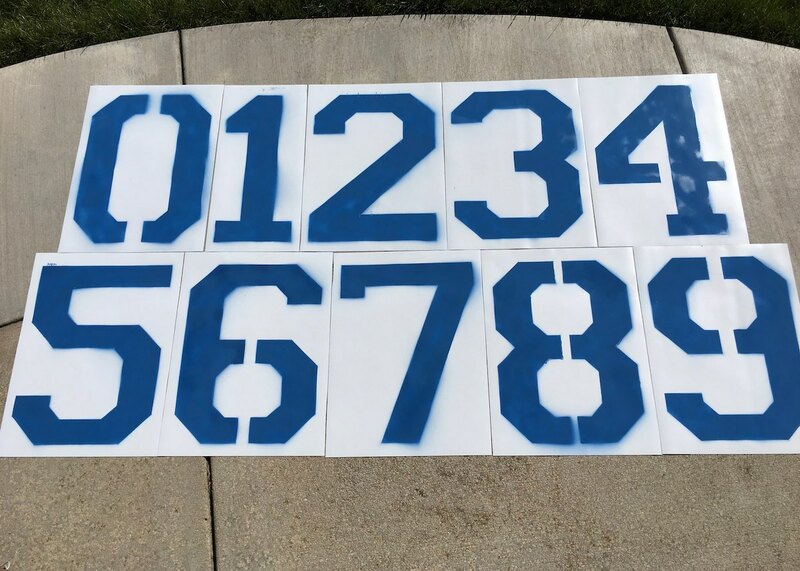 As a bonus, the plastic stencils can also be used to mark numbers on the field with grass paint! Since we new the score/numbers had to be 2 feet tall, setting the overall size was pretty straightforward. 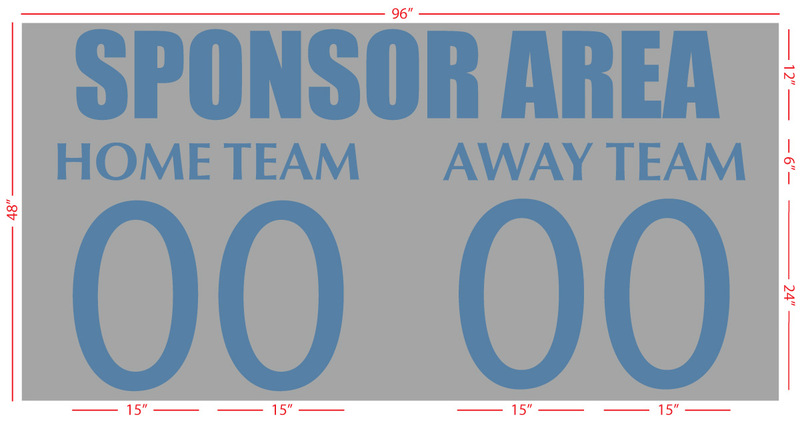 As you can see below, a 4 foot tall scoreboard would leave room for sponsors and home/away designations. By using a collapsible design with strong hinges at the top, this frame style made for a sturdy, self-supporting structure that could also be moved and stored with relative ease. With the major decisions sorted out, we assembled the supplies needed (listed below). The approximate prices as of this writing are also shown and include shipping for specialty items. With designs and materials in hand we set to work to build the scoreboard. Here are the basic steps. 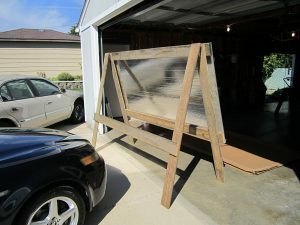 Step 1 — Assemble frame with pine boards, hinges, and chains. 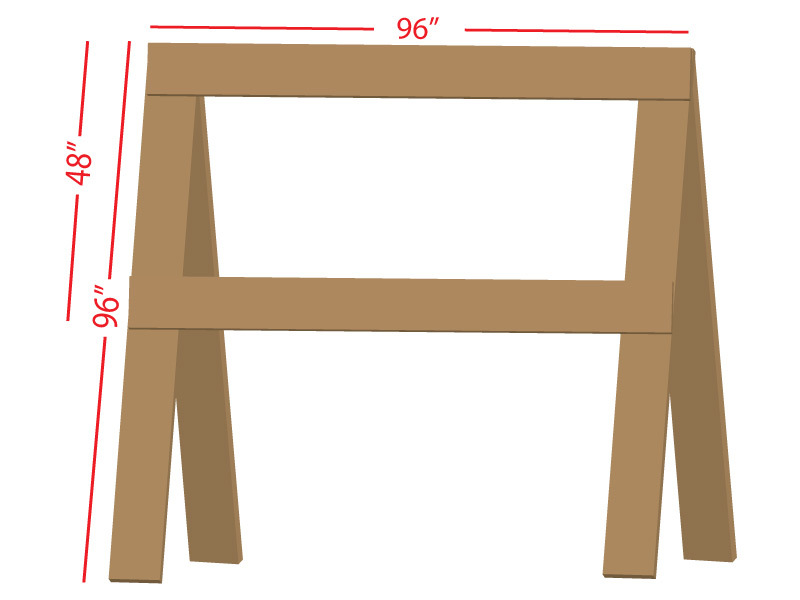 Use wood screws and pine boards to create two frames as shown above. 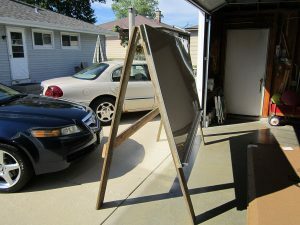 Each frame will be 96″ x 96″ in size with the two vertical boards connected at the top and middle with two horizontal boards. The distance between the two horizontals should match the height of the magnetic whiteboard. Connect the the top-left and top-right corners of the two frames with the hinges. Attach the 12″ chains to each side of the vertical boards to prevent frame from opening too wide and damaging hinges. Use screws to attach the white board to the frame. Drill the screws at the top and bottom of the whiteboard so that they catch the horizontal boards of the frame. Before starting this step, review the video at the top of this post. Measure out approximately 25% of the vinyl-coated magnetic sheeting on a flat surface and place the numeric stencil set on top of the sheeting. Ensure the stencils are placed squarely and are aligned along the bottom edges. Tape may be placed on the outer edges of the stencils to hold them in place, but this was not needed when we did it. Use the spray paint to fill in the stencils taking care not to hold the spray can too close to the stencils. Allow ample drying time according the paint manufacturers instructions. Review each number for light spots and touch up as needed. When the paint is dry, remove the stencils. Use an exacto knife and a heavy duty level or metal square to evenly cut each number from the sheet. Repeat until four sets of numbers — shown below — are complete. We found that signs.com was the cheapest source for custom magnetic signs. “Home” and “Away” text can be made in any text editor and used for ordering. Ensure that the text height is 6″. Optionally, also contact your sponsors for high-quality logos and order an appropriate sized magnet with a maximum height of 12″ and a maximum width of 90″. Below you can see how our scoreboard turned out! While we were happy with it, we did have a few ideas for improvement. You can attach hand cart wheels pretty easily which makes the scoreboard A LOT more portable. We used a 5/8” threaded rod to attach them. We recommend attaching some padding to the front edges of the frame if you plan to keep the scoreboard close to the field of play. We often put it right on halfway. It turns out that an 8-foot high frame is still a little low with coaches, trainers and players walking in front of the scoreboard. This means that the score is sometimes obstructed from view. A 12-foot high frame would still be accessible for changing the score and improve visibility for the fans. What do you use for a scoreboard? Do you have any DIY tips? I look forward to hearing about it in the comments below.